I’m a long-time listener of the A Playful Day podcast. 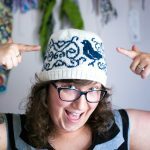 This year, Kate rebranded her podcast and is hoping to create a community that supports makers. And making in a less physical manner (digital design, music, writing, photography). I made a flipping SHIRT! With sticks and string! Or maybe I’ll just make something for the sake of looking pretty. Gotta love those wine & paint nights where you just go off on your own wibbly-wobbly-whim. There’s also something about doing things the slow way that is extremely satisfying to me. Like the time I collected acorns and simmered them for a day, then roasted them for an hour. It seems that people don’t know much about how things are made anymore. Because we don’t need to make from scratch, a lot of us don’t. Knitting seems like voodoo to some that watch me. Planting a garden and keeping it alive (not even thriving) seems like a major feat (when in reality, I probably visit my garden every other week sometimes and it seems to do quite fine without me). Seeing my friends turn flat fabric into a garment blows my mind. When I realized that I could create yarn with my own two hands from fleece, I was amazed. There is always something to learn and most crafts, even if they seem impossible, are within reach with a bit (or a lot) of practice. Yes, making is a slow process but it is so satisfying to make something from scratch — mindfully — yourself. To know every step from raw material to end product has made me appreciate the conveniences available to me. Most of all, it teaches me patience.